No more reciting PINs and missing customer calls. Your time is valuable. This was at the forefront of our minds when we first began AgriSync. This remains at the core of what we do today. With each update, our goal is to help experts spend more time solving issues, capture the time spent on those issues, and show the value of service. See the latest updates you'll find in AgriSync to help you spend more time on the issues that drive value for your business. 1. "Can you read me that PIN?" Convert images to text. Asking your customer to read you off a serial number and reciting them back for accuracy is not time well spent for your service technician, your customers, or your dealership. But it is necessary and important information. Now in AgriSync, advisors and farmers can easily add product identification numbers, serial numbers, or machine hours to tickets by simply snapping a picture. 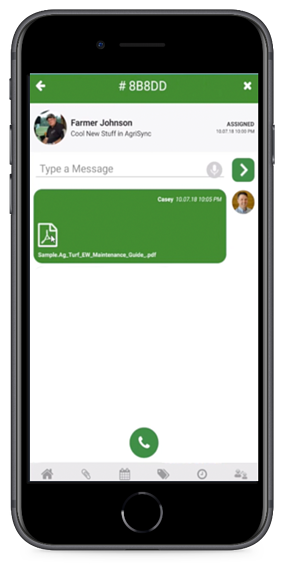 When an advisor captures an image in a ticket or a live video call, AgriSync converts that image to searchable text and attaches the information to the ticket, helping service technicians spend more time solving issues and less time on tedious tasks like recording serial numbers. 2. Sending Knowledge Base articles? Attach PDFs to tickets. We're making it easy to share followup information or knowledge base articles with customers. Simply grab a file from your Dropbox and attach to a ticket in AgriSync. 3. Missing customer calls? Rollover to more team members. Missed calls mean lost business or unhappy customers. In either case, missing a call is not improving the bottom line for your dealership. VoiceHub increases the odds a customer connects with your team of experts when they call by simultaneously ringing your team. We're taking VoiceHub a step further with priority ring schedules. As the phone continues to ring unanswered, you begin ringing additional people on your team. Ring two people first; if they don’t answer after a few seconds, begin ringing additional team members. Keep customers out of voicemail and help your team of advisors manage inbound calls with priority ring schedules. 4. Setting up a hotline number? No need to call IT. Select a VoiceHub number by area code. So simple you don't even need to call IT. 5. In the office? Ring a landline. During peak seasons like planting and harvest, you're probably spending the majority of your day in the cab of a truck. We've got you covered with VoiceHub, your mobile call center. If you're working in the office, you can now adjust your VoiceHub settings to simultaneously ring your mobile device and your desk phone. 6. Using an iPad? Flip it sideways. AgriSync now supports horizontal orientation on an iPad. Just flip it sideways. If you're in a live video session or sending a pro-active broadcast alert, know your customers on the other end will have a great visual experience, whether your video is oriented vertically or horizontally. Take a closer look at how AgriSync adds value to service plans and drives the best collaboration between farmers and expert advisors on the frontlines of agriculture.